The Balm In Gilead, Inc. is proud to announce the 3 rd Annual Healthy Churches 2020 National Conference. 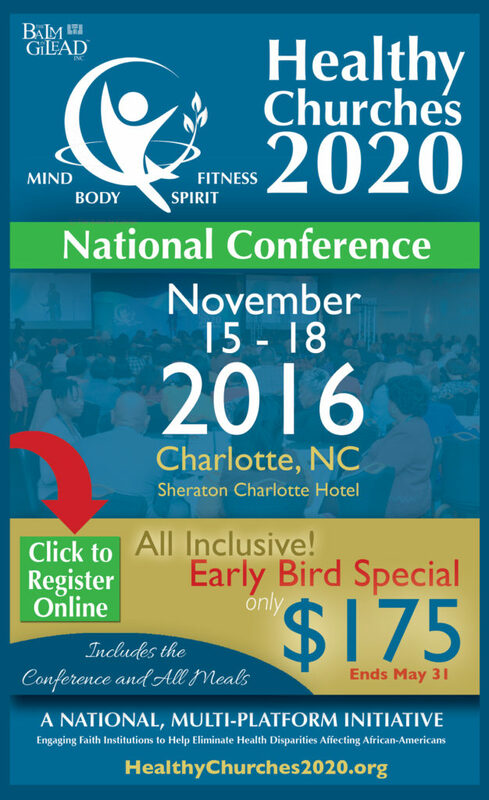 The conference will be held November 15-18, 2016 in Charlotte, NC. This 3-day national, capacity building, training conference brings the nation’s prominent public health and faith leaders together to address the alarming rates of health disparities among African Americans. The early bird special registration fee is through May 31. The conference is designed to strengthen the skills and leadership capacity of pastors and persons who are responsible for the Health Ministry, Annual Health Fair, Kitchen Ministry, Nurses Ministry, Men and Women’s Ministry and all aspects of health and compassion within the congregation and community.